I installed MX Linux as my first Distro for this PC, but I'm having a problem. I installed and partitioned on my Samsung 970 SSD, but when I got to the part where I install Grub, it wanted to install it on my 850 SSD by default (which has Windows installed). When I changed the drop down to my MX SSD (the 970), it greyed out the "ESP" option. 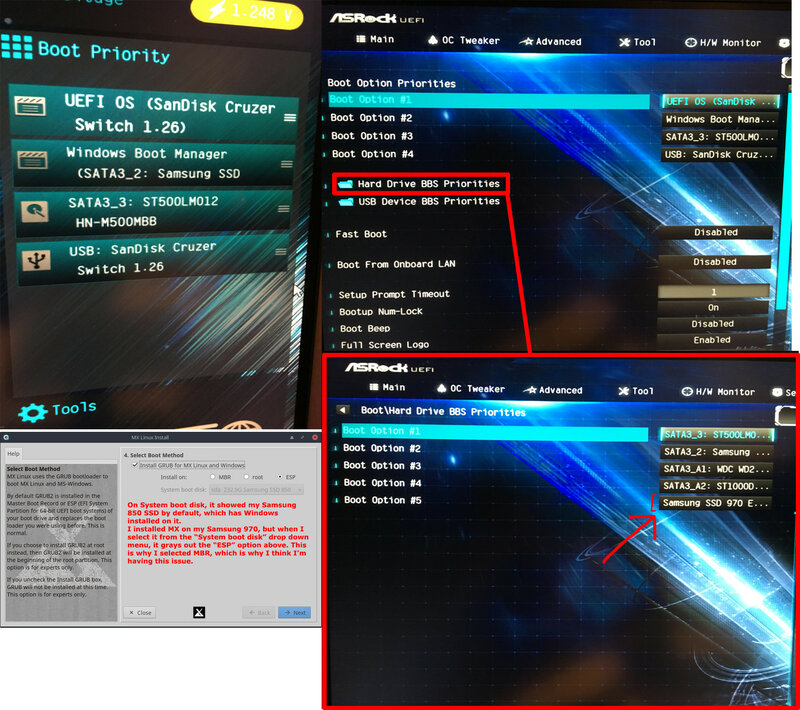 Because of this, I chose "MBR" for my 970 SSD, but as a result, I can't find the drive in the boot options for my BIOS. In my boot options, I have my Windows SSD, the USB I installed the Distro with, but can't see my 970 anywhere, except for "Hard Drive BBS Priorities", but I don't understand what that means. Initially, I formatted as msdos in the partitioning segment of the installation. Then I did the same with GPT, only to have the same problem (I chose "root" instead of "MBR" this time). What can I do to address this issue? are you able to select either drive from F9 or similar ? & then install MX onto that other drive & re-boot to check that it does work. - then re-connect that first drive & test out, the dual system. the windows system typically is in UEFI Mode & you have to install the Linux in the Same Mode. or, you will have issues in accessing one or both of the systems. do try, to get them working separately, first off, with an manual select of each one. 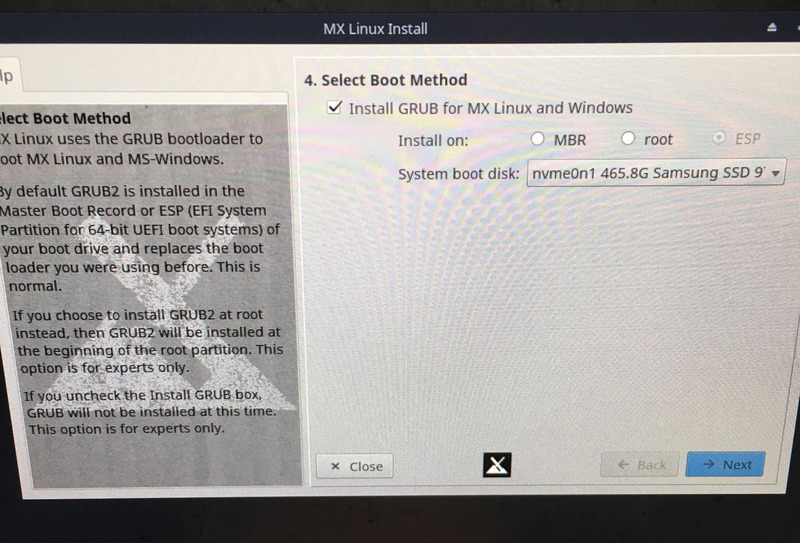 When you boot UEFI, choose ESP not MBR or Root, to install GRUB to. Plase to post the text output here between the code-tags [code] [/code] ( Icon above editor window </>.